No matter what type of music you're preparing to record, getting a good drum sound is the foundation of a good recording project. Whether you're a drummer wanting to test out your new 8 track recorder or an aspiring sound engineer recording a live band for the first time, trying to mic a drum kit and getting a halfway decent sound can seem not just intimidating, but completely overwhelming. With decades of experience recording live bands, Dennis Moody is the engineer of choice for many of the industries top drummers. He has worked with Dave Weckl, Ricky Lawson, Michael White, Steve Farrone, Vinnie Colaiuta, Jeff Parcaro, Gary Novak, Dennis Chambers, Gregg Bissonette, Alex Acuna, Chad Wackerman, Danny Carey, Tom Brechlein, Harvey Mason, Chester Thompson, Bernard Purdie, Gerry Brown, James Gadson, Oscar Seaton, Bill Stewart, Joe La Barbera and many more. Ready to start recording your first drum kit? Where do you start? How to do it? In his book, "The Drum Recording Handbook", he will give you tips on mic selection and placement, when to use and not use EQ, using signal processing devices such as "noise gates" and "compressors", panning and positioning the drums across the stereo spectrum, balancing tips, phase issues and how to avoid them so that you will get a full and complete sound from your drum kit. He will also give you some tips on getting a drum sound "on a budget" if you are restricted with the amount of gear available to you. In "The Drum Recording Handbook" you will be given tips to start developing your own unique style that will have your recordings sounding great!! No matter how good your recording gear is, chances are you're not getting the best possible sound because of the deficiencies of your room. 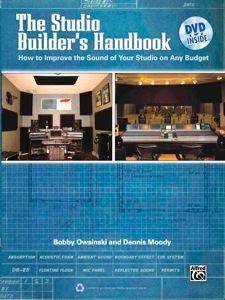 While you might think that it costs thousands of dollars and the services of an acoustic designer to improve your studio, "The Studio Builder's Handbook" will strip away the mystery of what makes a great sounding studio and show how you can make a huge difference in your room for as little as $150. The Studio Builder's Handbook also features interviews with expert contractors, studio designers, producers and engineers that give you a look into their personal studio building experiences. As a bonus, an accompanying DVD provides a look at the actual construction of acoustic panels and bass traps, as well as a guided tour by a studio builder. SoundTips" is a reference application where anyone can learn the basics of recording almost any instrument. Authored by Grammy nominated and platinum award winning engineer and producer, Dennis Moody, this app is filled with tips acquired over decades of recording for the stars. For the beginner or home recording enthusiast, the info supplied in this app will help you to get started on your way to great sounding recordings! Moody covers basic recording techniques for vocals and vocal groups, guitars and stringed instruments, strings and string sections, pianos and keyboards, assorted kinds of basses, brass, woodwinds, drums, and various types of percussion instruments. He also lists many of the most commonly used microphones he has seen in the top Hollywood studios during his years as an engineer. Even the smallest of budgets will be able to get a mic you can afford you started and on your way. After working on thousands of recording sessions, Moody knows how these instruments should sound. And the tips he gives in this app are a great place for you to start! Available for iPhone and Android operating systems! !